I am continuously asked about carbohydrates: “Should I cut carbs out of my diet to lose weight?”, “Which carbs are healthy?”, “Can I eat carbs and still lose weight?” So let’s have a closer look at carbohydrates & I’ll break down the science for you! Cutting carbs completely out of your diet will result in weight loss. However this happens with any macronutrient. You will lose weight if you cut protein out of your diet and you would also lose weight if you cut fat out of your diet. This is because you’re reducing your total energy / calorie intake. If you’ve ever tried to cut carbs out before, you may have noticed some symptoms. You may have felt tired, lethargic & stressed. You may have experienced mood swings and sugar cravings. And you may have also experienced bowel issues. The reason is because your brain and muscles run off glucose, which is a breakdown of carbohydrates. Cutting carbohydrate containing foods completely out of your diet can lead to micronutrients deficiencies (eg B vitamin deficiencies which are needed for energy production) as well as gastrointestinal & gut health issues like constipation. This is because carbohydrate containing foods are a valuable source of fibre, wholegrains & prebiotics which are all needed for gut health. So if cutting carbs out of your diet can result in weight loss but also has health consequences attached to it, what should you do? You should look at the type and amount of carbohydrates that you are consuming. 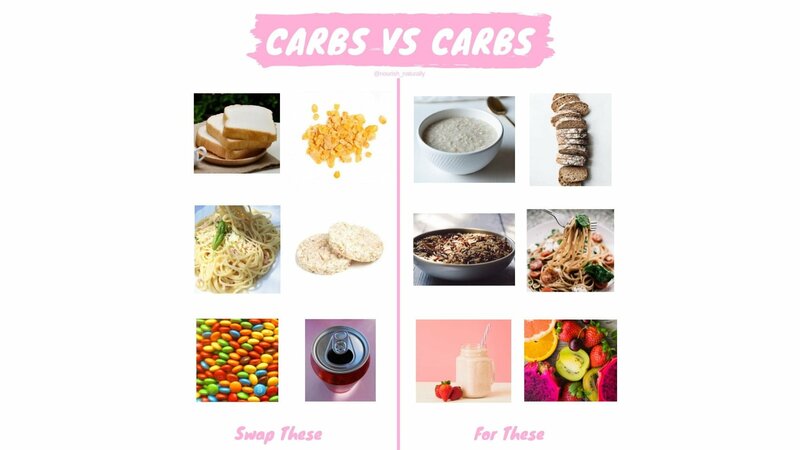 There are some carbohydrate containing foods that you can eliminate or reduce your intake of that will benefit your health and help you lose weight! 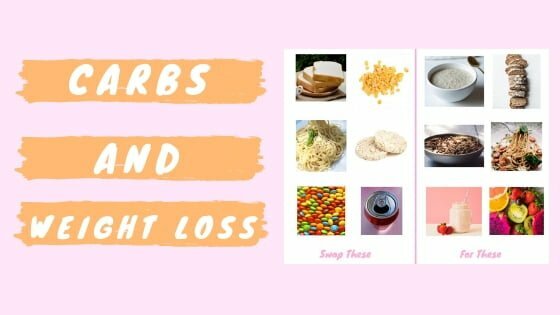 And there are carbohydrate foods that you can KEEP in your eating that will benefit your health and can also help you lose weight!! The carbohydrate foods that you can eliminate or reduce your intake of include highly refined, white carbohydrates (see foods on the left hand side of the infographic below). These foods provide you with little or no nutritional benefit and do not need to be consumed as part of a healthy diet. Note – I am not advising to “never” eat these foods. Instead, consider how “often” you are consuming them and think about swapping them for more nutritious carbohydrate foods that will benefit your health. The carbohydrate foods that will benefit your health and can actually aid weight loss include wholegrain, low GI whole food carbohydrate options (see foods on the right hand side of the infographic below). These foods will provide you with essential nutrients for good health, including fibre & pre-biotics for good gut health, low GI energy for your brain and muscles and fibre to keep you feeling full. For more info on the exact carbohydrate foods you can eliminate and which carbohydrate foods you should keep eating, watch my latest youtube video.